Imagine waking up every morning to fresh event reports on climate change, livestock, and dietary shifts, and contributing to the hot discussion with researchers, practitioners, and activists after dinner. 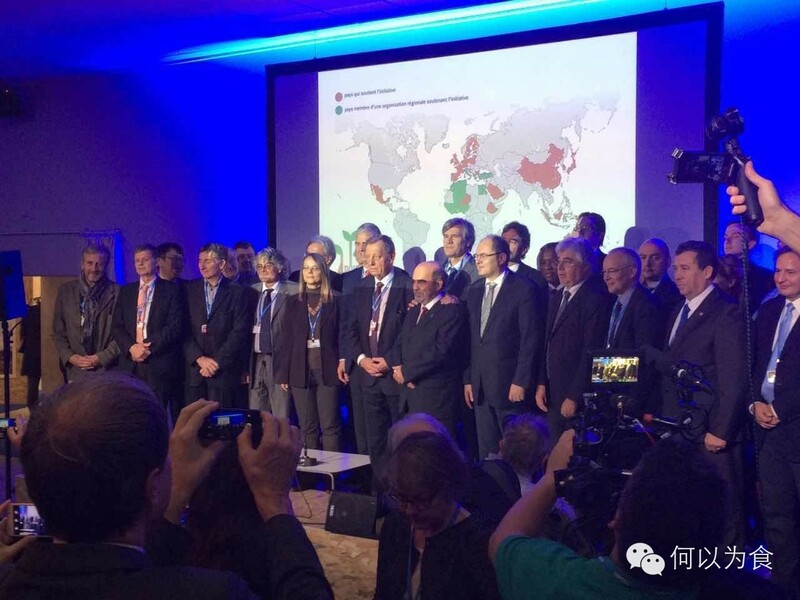 During the 21st Convention of Parties (COP21) in Paris, Brighter Green experimented on such an engaging project using WeChat, a smart phone application phenomenon in China. Almost everyone in China with a smart phone uses WeChat. It has the function of both WhatsApp and Facebook, allowing group discussions and sharing of photos, articles, and videos with followers. Since December 2014, Brighter Green has organized monthly discussions featuring experts on animal rights, nutrition, and diet, as well as the environment; the series is called Global Dialogue Online. In the WeChat group established for a certain topic (e.g. farm sanctuaries, veganism, livestock and climate change, animal protection, etc. ), the guest speaker can communicate with an audience in English or Chinese, with nearly simultaneous translation by volunteers. Brighter Green collaborates with What’s For Dinner? director Jian Yi and intern Miao Jie, in addition to a growing group of global volunteers, to coordinate these monthly live chats. Global Dialogue Online is an interactive aspect of the larger What’s For Dinner? (WFD)-themed WeChat group, which posts engaging, rich, unique content articles almost daily. In December 2015, the typical 2-hour long dialogue became a special project that lasted two weeks. Mia MacDonald and Wanqing Zhou acted as guest speakers on the ground, reporting on interesting side events and Brighter Green activities at the COP21. They also worked with Ling Wang, journalist from Caixin, a Chinese news and financial media outlet, to share updates on the negotiation progress. Launch of the 4 Per 1000 initiative at COP21 on Tuesday December 1st. 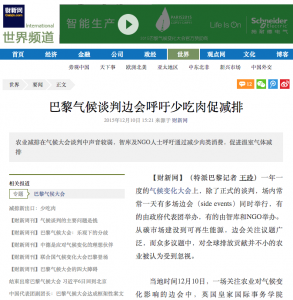 During the first week, Wanqing reported on the French “4 Per 1000” initiative on soil health, as well as several other side events on agroecology, agroforestry, diet, and nutrition. The concept of improving soil health as a way to sequester excessive carbon in the atmosphere was not familiar to the general public. Farmers and agricultural researchers in the group (from both in China and abroad) led a discussion on the positive role that agroecology can play in fighting climate change, increasing food nutrition, improving food security, and the health of farmers, consumers, and the planet. Apart from scientific facts and technological experience, social and economic aspects of the topic were also raised. Side events organized by Global Forest Coalition, Brighter Green’s partner, emphasized the controversies of carbon markets and the commercialization of carbon sequestration in forests. As soils are perceived as the real hope for reversing climate change, the commercialization of soil carbon has become a new concern for small farmers. However, this information didn’t bring up a lot of questions from the WeChat group, although there were many farmers practicing organic agroecology. One researcher in the group pointed out that the commercialization of carbon had caused problems in so-called “climate-smart agriculture”, but it seemed that other group members were not familiar with the concept of carbon market and trade. This might be due to the small number of agriculture-related carbon trades in China. 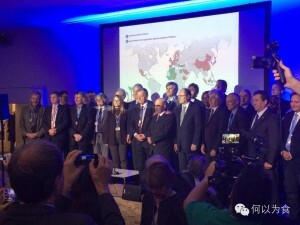 Wanqing speaking at Brighter Green’s side event on December 9. Brighter Green’s side events took place in the second week, when the number of other side events related to meat production and consumption also increased. These stimulated the discussion on animal farming and its impacts on climate change, environmental pollution, food security, and public health. Experience of dietary change was also a hot topic, with philosophical reflection on the widespread overconsumption of meat and in general, on the differences between typical western and eastern views of nature and health, and on whether meat, eggs, and dairy should be categorized as foods at all. It is not clear how many people in the group are already following a vegetarian or vegan diet, but among those who actively participated in the discussion, at least half were not. However, based on the discussion, consensus was that a plant-based diet is better for the health of people and the environment. 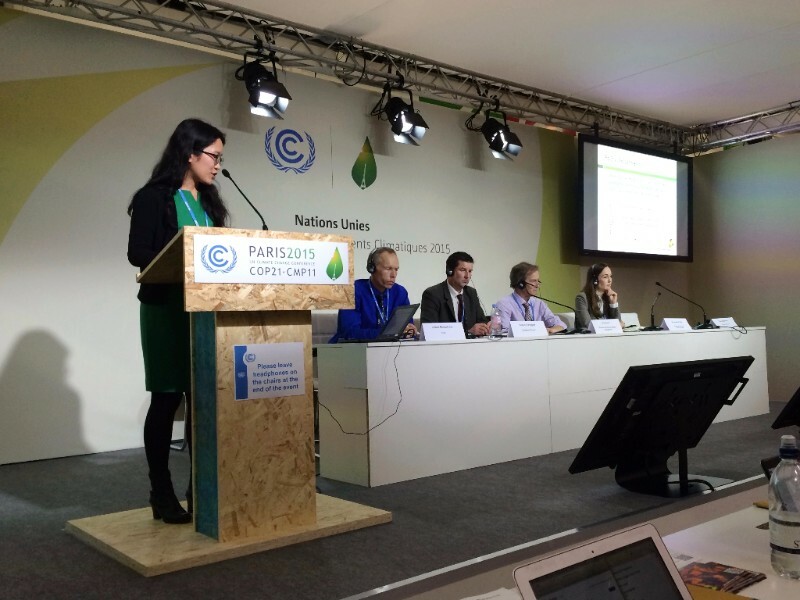 Caixin article featuring Brighter Green’s activities at COP21. Hongqiao Liu from the Earth Journalism Network also reported on the Brighter Green side event, as well as the neglected issue of meat in the climate negotiations. The role of regenerative grazing was brought up by some WeChat group participants who followed this method in their research. It was agreed that although regenerative grazing, when done correctly, can help restore ecosystems and sink organic carbon into the soil, more research is needed to study the effectiveness of this practice in different areas, and better farm-level measurement is needed to show the net climate impact on commercial stocking rates, before it is used to encourage the consumption of “carbon-sink meats”. This is especially true in developed countries like the U.S., where per capita meat consumption has already exceeded threefold a level that poses serious threats to human health. At the same time, as shown in the WeChat group discussion, an increasing number of people in China, where the per capita meat consumption is 50% lower than that in the U.S., are waking up to the fact that the human body doesn’t require animal-based foods to be healthy. Since the real time dialogue began in the WeChat group on November 30, contents of the discussion have been compiled by volunteers on a daily basis for sharing on WeChat. Thanks to the active contribution by knowledgeable group members from China, the U.S., and Canada, our discussion was widely recognized as containing “lots of real stuff”. During the two weeks, group members continued to invite their friends to the group, bringing in new participants every day. On December 7, excerpts from the first week of group discussion were edited into a WeChat article and posted on VegPlanet, the largest vegan online platform in China, and reached nearly 1800 readers. 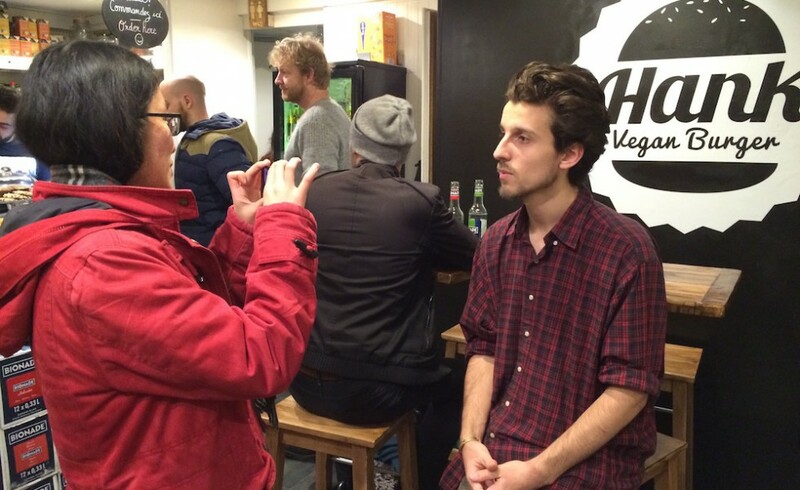 Five days later, information shared in the group inspired a group member to dig deeper into the issues, and posted another long WeChat article explaining the global connection between the livestock industry, climate change, genetically modified crops, small farmer livelihoods, malnutrition, and soil health, as well as how the negative impacts can be reduced by lowering consumption of meat and supporting agroecology. It is encouraging to see the general public becoming increasingly concerned about the problems of livestock production and overconsumption, and sharing their opinions openly using information technologies to benefit more people. One year after we launched the WeChat Monthly Global Dialogue, our readership and volunteer group continues to grow, and we are seeing richer involvement in the discussion. Looking forward, activities like this are leading towards not only raised awareness, but also real actions for a more sustainable food system. To learn more about Wanqing and Mia’s experiences at COP21 and further analysis, see our dedicated page here.